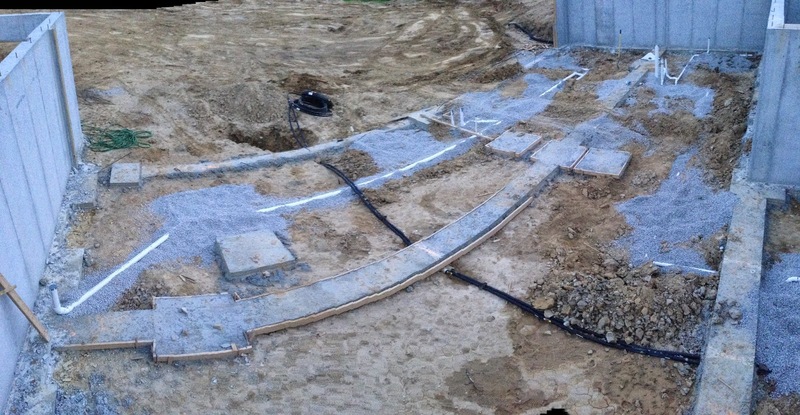 With the ground drying up, our next step was to get in the underground plumbing, also called ground rough plumbing or underslab plumbing. I took the day off from work to get it done. Fortunately, I also knew someone with plumbing experience that came up to help. It was the hottest day of the year so far, with temps in the mid-90's. We laid out our plan, with me adding one additional bathroom to the basement "just in case" we want a second bathroom down there in the future. We then had to dig in some trenches for the pipes to lay in. With underground plumbing, you need at least one inch of "fall" for every 8 feet of run so that the pipes will empty. Since the house is fairly long, that meant we had to dig down quite a bit to get enough drop. 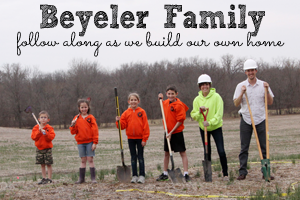 Fortunately we were able to use the Bobcat for some of the work. I also made a change to where our plumbing exited the house. 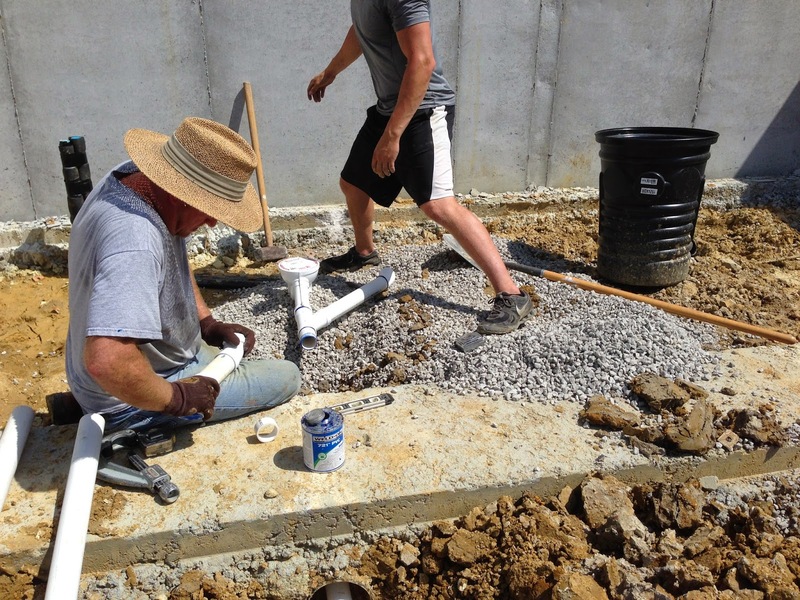 When the plumbing lines go through the foundation, they pass through sleeves, or pieces of large pipe that are put in under or through the concrete before it is poured. Unfortunately for me, when I changed where our plumbing exits the house, I picked a spot that did not have a sleeve. This meant I had to cut a spot out of our frost footing. It took about three hours with a concrete saw, jack hammer, and 12-lb sledge hammer, but eventually the opening was in and we were ready to go. After the plumbing was done I was worn out. I headed up to Steve and Kim's house and took a quick break and ate a sandwich. Half way through the sandwich the neighbor came over concerned that one of our goats wasn't doing to well in the heat. Apparently the leash cable he had been wearing had caught around his neck and partially suffocated him. 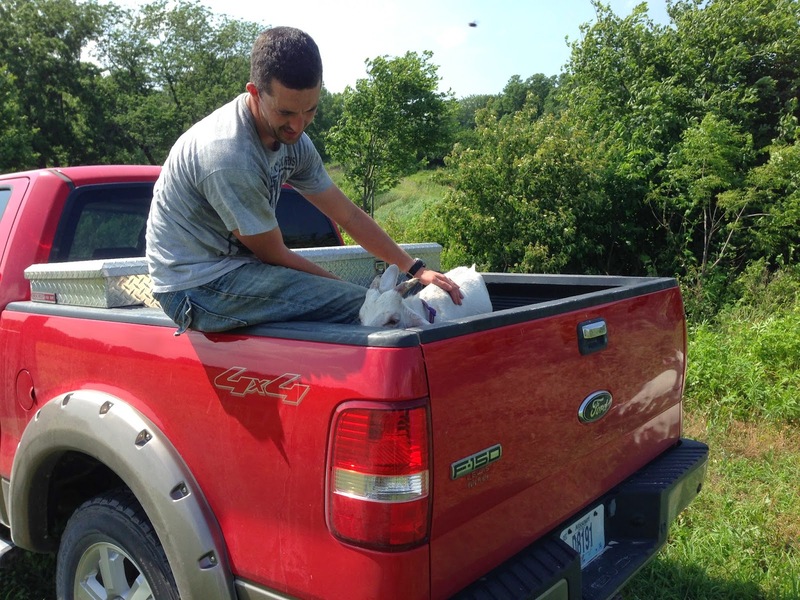 We hurried out and had to bring him back up to the house in our makeshift goat ambulance, with me in the back. Fortunately he has still breathing, so I didn't have to perform goat CPR.